After China’s Third Plenum, the decision to relax the one-child policy made international headlines. Many of these articles missed the broader theme: China’s government is finally acting to deal with the demographic crisis caused by an aging population. In particular, Section 45 of the Third Plenum’s “Decision on Comprehensively Deepening Reform” (commonly referred to simply as “The Decision”) outlined a series of proposals to try and keep China’s pension fund for retirees in the black. 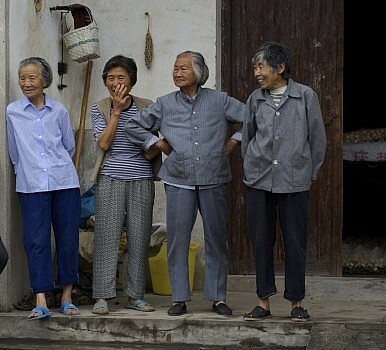 China’s pension system faces the challenge common to all countries with an aging population: how can the government fund an ever-growing pool of retirees based on pension contributions from an ever-dwindling number of active workers? A report by the Paulson Institute estimates that by 2050, China will have 1.6 active workers for each retiree, a far cry from the current ratio of 4.9 to 1. China is far from alone; the same report estimates that the European Union, Japan, and South Korea will actually have lower ratios of active to retired workers in 2050. However, China’s social security system does face some unique challenges. For one, the pension systems are generally controlled by provincial or city governments, resulting in a maze of different regulations and standards that serves as a barrier to labor mobility. There are also completely different pension systems for urban and rural workers. Worse, with pension money in the hands of local governments, many been unable to resist the temptation to “borrow” money from current workers’ individual retirement accounts in order to foot the bill for today’s retirees. According to estimates, individual accounts could be short over 2 trillion RMB (around $330 billion), and might be missing up to 90% of their funds. All funding problems aside, many Chinese see the pension system as inequitable. “The Decision” tacitly admits this by calling for a “fairer” system. The fragmented nature of the system causes pensions to reflect the preexisting income equalities in China’s rural-urban and coastal-inland divides. Further, Chinese government employees receive a guaranteed pension at levels as high as 95% of their salaries. Workers for private companies receive closer to 40% of their salaries as a pension — after having been required to kick in 8% of their salaries to a retirement fund, a rule from which government employees are exempt. This creates what is known in China as the “dual track system”, where government employees can contribute no money and still expect their pensions to be two to three times higher than those of their private sector counterparts. The good news is that the Third Plenum took steps to address or at least acknowledge many of these programs. After “The Decision” was released, Beijing Daily published an interview with Jin Weigang, the Head of the Social Security Research Institute at the Ministry of Human Resources and Social Security. Jin explained in more detail how the various reforms outlined in the document would work in practice. Among the key points was a repeated desire for pensions to be more equitable, including a vague promise by the government to adjust the government pensions to bring them more in line with private sector retirement benefits. Jin also outlined the government’s plan to cope with the root problem of fewer workers and more retirees. The most basic idea, increasing the retirement age, might also prove to be the most controversial. The idea has been floated in the past year by several scholars, and has received almost universal condemnation from the general public. Perhaps for this reason, Jin emphasized the “gradual” nature of any changes, giving the example of the government raising the retirement age by six months every year after a buffer period. According to Jin, one possible plan would be to have the retirement age reach 65 by the year 2030. Interestingly, Jin did not address the current discrepancy between retirement ages for men (currently at 60) and women (currently at 55 for white-collar females and as low as 50 for factory workers). Raising the retirement age to 65 would not be a huge leap for males, but would be an increase of 10 or even 15 years for women — hardly a “gradual” change. Still, Jin cites a study that estimates raising the retirement age by five years would save China 20 billion RMB (around $3.3 billion) per year, thanks to the double effect of more payments to and fewer withdrawals from the pension systems. The change is necessary to sustain China’s workforce, Jin said, citing the fact that China’s working-age population declined for the first time in 2012. A recent editorial in the Global Times similarly attempts to smooth the way for what will be an unpopular but inevitable policy change. Overall, though, Jin seemed surprisingly unconcerned about the long-term financial health of the system. He claimed that there is currently a surplus of 2.4 trillion RMB (around $390 billion) among the pensions of all Chinese workers. In fact, both “The Decision” and Jin discussed a plan to actually lower the social security fees paid by private enterprises. Jin said that the move would increase the competitiveness and longevity of Chinese businesses, thus helping boost employment. State-owned enterprises, meanwhile, are expected to nearly double their payments into the National Social Security Fund. Still, it’s hard to see how the government can lower private business payments into the social security fund and still keep the books balanced. According to some estimates, the national government spent 220 billion RMB in 2011 to subsidize the pension fund. The surplus cited by Jin is concentrated in China’s wealthy eastern provinces and cities. It’s not inconceivable that there is an overall surplus even while the national government has to prop up pensions in poorer areas. Jin expressed his hope for a comprehensive national plan to help smooth out discrepancies in the local retirement systems, but unfortunately “The Decision” had little to say on this front. There is a plan to merge the urban and rural retirement systems, but presumably the new system would still be administered by local governments. Without a national pension scheme, or at least central government oversight of the local retirement funds, it will be difficult to eliminate the inequalities and limitations of the Chinese system. As China’s population continues to age, more and more citizens will call on the government to uphold the implicit and explicit promises it has made to care for the elderly. Despite the widespread focus on more general economic and social reforms, how China adjusts it social security programs in the next decade might have the most direct correlation with the contentment of its citizens. Will China's aging population bring down the economy?